Was in boot camp at MCRD San Diego in '75, couldn't believe that the non-Minnesotan hicks in my platoon had never heard of Mel Jazz. Status: offline 5 year old boot camp attending Mel Jazz fan. 47 came out purple. Moved away from Minny in 1989. Joined the Strib for more Viking info since I lived in other states in the mid 90s. It would be nice to know the date I joined the strib. Gosh that was a long time ago. We only had 4 channels growing up. And the choices of things to watch was very limited. But Sundays were always the best day since it had the Vikings at noon and the wonderful world of Disney that night. Gosh when it was an Olympics year it was like Christmas for 2 weeks. Anyways, my first Viking memories that really stand out were the Ahmad Rashad years. He will always be one of my favorite Vikings ever, since he was the first. The 13 minute mark on this link will be forever etched into my brain. When I moved to Kansas I used to get the VikingUpdate in paper copy. I really anticipated getting that every week. This Viking helmet that my brothers wore in the 60s and I wore in the 70s is my most prized possession. P.S. I love the bread bag references. Very possible you attended boot camp with my brother. I had that shipped to me in Laguna Hills as well. Thanks for the link. That's one of my favorite memories from watching the Vikings when I was growing up. I remember cheering so loud at the end that it woke up my dad who had quit watching and decided to take a nap after they'd fallen behind 23-9. BTW, our kicker, Rick Danmeier, had a horrible game that day. He was 1 for 4 on XPs and 1 for 3 on FGs. If he'd made one more earlier kick, it would have probably never come down to that hail mary play. Platoon 2027? I forget the series. 5 year old boot camp attending Mel Jazz fan. I didn't even know how to spell it, it's Mel Jass. Although someone claiming to be his step grandson didn't seem to be too enamored with him. Status: offline Just saw this thread, and of course (everyone who knows me here will nod to themselves) this is right up my alley. Thanks, Dan. I'm 59. Earliest memories are a bit vague, dating to the '62-'63 seasons or so. Remember Paul Flatley at WR, Ron VanderKelen at QB, Alderman at guard, and that's about it. By '64, I was into it a bit more (age 8, born October of '56). I recall the Marshall wrong-way play at Kezar Stadium vs. the Niners. Had a bad headache that afternoon and was laying in misery on the living room couch when it happened. Our identity was of kind of a rock 'em, sock 'em squad in those days. Toughness reigned. Lost a lot more than we won, but remember, we were a TRUE expansion team in '61, got the castoffs of all the other squads, plus the draft of course. Very tough sledding vs. the established squads in the NFL. The Bears, the Lions, and the Packers were all extremely successful and we had a mountain to climb to compete. 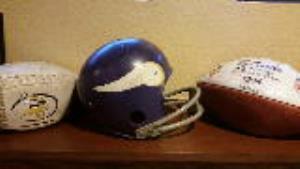 Crystal clear memories of the '68-'69 teams, which began the winning tradition of the MN Vikings. Had we had just a little better QB play (Tark was in NY) in those days, we'd have won at least a couple of SB's then. Kapp was "magic" for a year, but contract issues killed his time in MN. Shipped him out to New England. By the time Tark returned, we were 4 years into our "window" already. That window effectively closed when Drew Pearson pushed off in December, '75. Made the big game the next year, but we were too old by then. A nice 9-year run was over. Bud hung on for another 6 years, but never had the horses after Jim Finks split to CHI, where he built the Bears powerhouse of the mid-80's. Was very proud of the '87 team, whose replacements lost all 3 tilts and cost us HFA for the playoffs. We upset N.O., pounded the mighty 49'ers, then fell ill and got edged by the Skins at RFK. Wrote Burnsie and brief letter of congratulations and respect, got a signed letter back thanking me for the note & for the fandom, plus a color photo of that team. When Doleman and Millard were at their peak, they were MONSTERS up front. We'd have pounded Denver in that Super Bowl, alright. The flu bug got that team. Zimmer seems to have "it". This current squad impresses the heck out of me. Look out, NFL...the star of the north is nigh! Skol!!! I don't know what that means. All I know is he went out to boot camp in SD at that time with two other guys. Status: offline I'm 58. Became a Vikings fan when Dad went to Southeast Asia in '69 and parked the family with farming relatives in Southwest Minnesota for a year. One of the best years of my life-- loved the PPE, Kapp, the whole Bud Grant attitude; that team made the whole state feel like a close-knit community. Random memories-- Bill Brown always wearing short sleeves... Roy Winston's hit on Larry Csonka... Gary Larsen wearing number 140 in camp after the first (awful) 7-7 Tarkenton year... Bobby Bryant's pick 6 vs. Dallas in the playoffs... owning the Rams in the playoffs... not drafting Marcus Allen... the Moss rookie game at Lambeau... AD's record game vs. the Chargers. I'll always bleed purple! Usually you've got like 4 platoons (approximately 50-60 privates in a platoon) each platoon has a number, and 4 platoons make up a series. The series also has a number. The 4 platoons advance through boot camp simultaneously, in part serving as competition for each other. I was in boot camp end of Feb to the end of May. Maybe you could ask your bro. I wish I could. I'll see what mom knows. We used to dream of having bread bags. And boots ! When I was a kid we'd never heard of bread bags. And again, not to sound like an echo chamber here, but we never heard of television when I was a really young kid. And I'm not kidding a bit on that or the bread bag thing. Status: offline We used to use a bread bag inside our snow boots when we were kids. Status: offline Bread bags? Snow boots? Luxury. I had to slosh around in hollowed out 4L milk jug containers wrapped in re-used plastic wrap. Status: offline 46- Born and raised in Minnesota metro area. Lived in Minnesota until I was 29. Moved out east in pursuit of career and currently reside in Portland Oregon. I was born into Viking fandom. Father is a lifer. Recall asking a gazillion questions about the game while we watched and getting a "spanking" for asking my father "do you think the Vikings are gonna win today" in church, guess thats not a good question to ask in the house of the Lord ... still dont understand why ... maybe a few more prayers need to be answered who knows. I know I believe it will happen ... the Super Bowl win ... just wish I knew it! My first recall of a game was the Steeler SB and how disappointed my Dad was. The following year was when I was hooked for life. Watched all the games with my Dad. We always got home just in time from 1030 service. It was magical. The entire state seemed to stop for 3 hours on Sunday afternoon. The team was dominate in '75 and always found ways to win. The PPE, Krause, Tark and Grant were Iconic and instant heros. The afternoons after the game were playing football ... even if by myself announcing the game ... you betcha the Vikings always win that one. The Vikes gained HFA advantage throughout and expected to win their 3rd NFC title in a row and of course Minnesota knew it was their year. My Dad got the opportunity to go to that game if you call it that. I watched at home. The way it ended haunts me to this day. I was inconsolable even the next day. It was wrong, unjust, unfair ... How could this happen, people cant cheat and get away with it ... Why did nobody change this, its on TV, there is Video evidence? It did happen and I swore some day this wrong will be righted. I along with all of you am still waiting. The following year was another great season ending in another SB loss. I remember the game vividly because we had the neighbors over for the "Big Game" and mom decorated the place Vikings. It was a festive day buzzing with energy awaiting the game. The adults were all so happy (wonder why). The game started great, Matt Blar blocked a Ray Guy punt and the Vikes had it on the goal line. McClanhan fumbled and the Vikes never recovered. The house emptied so quickly and was just so quiet. It happened again ... we got to win it next year! Yet next year has yet to come for Viking fans. The Vikes were good again going 9-5 but Tark got hurt. We won the mud bowl in LA and lost the NFC Champ to that team again. Tark held on another year but the team was getting old. Alan Page was traded to the Bears, it was weird. Page is as good a football player to ever play this game! Anyways Bud held on a couple more years. The Vikes moved into a dome and Bud righted the ship after Steckle led it way off course. Burnsie took over in the mid 80's and stabilized the franchise leading the Vikes back to repectability. '87 was an amazing run that again ended in bitter disappointment as Darrin Nelson dropped a potential tying TD in the waning moments. Earlier in the 4th the Vikes/ Burnsie settled for a 18 yard FG to tie the game failing to get in from the 1 yard line. The Nelson moment was the sinking moment but the falure to convert a TD was crucial. Then Mike Lynn traded away a great team for one player and Burnsie never recovered losing a couple more playoff games before missing them 2 years in a row. The team was sold, Lynn was gone and Burnsie was let go or retired (dont remember) in '91 ushering in the Dennis Green era. Denny got off to a great start leading the team to playoff appearances that ended in bad losses most notable to the Bears at home. I wonder if Green survives had they lost to the Giants in '97. However Green drafted the greatest athlete to ever wear a Viking uniform in'98 named Randy Moss. Most all on this site are familiar with that team. In fact maybe why some are Viking fans. That team was equally as special as the '75 team, in fact slightly more but its reallly semanatical both transcended in my mind. Blew through the regular season with nobody having an answer for this rookie WR. Add Cris Carter and former MVP Randall Cunningham resurrecting his career and playing ten years younger. The offense set new scoring records. Moss was ROY, Cunningham NFC offensive MVP and Gary Anderson was perfect. After taking care of the Cards the "dirty birds" Atlanta Falcons rolled into town with a 15-2 record. The offense put up 20 points in the first half and if not for a crucial fumble at the end of the first half take a 13 point lead into the break... the fumble inside the twenty led to a TD and kept Atlanta very much in the game. The Vikes were leading 27-20 in the 4th Q when another dark moment, perhaps the darkest, occured...Gary Anderson would miss his only FG of the season and opened the door for the those "dirty birds" to mount a comeback which they did with a soul crushing OT loss. How can this happen? Why? I swore the Hail Mary would be righted and this was the year ... but that was and is not the case. Still with Moss there was great hope. They drafted a QB in the 1st round and Cunningham and George were coming back. After a rough start the Vikes got into the playoffs and beat Dallas only to lose to the Rams. The next season was looking great , maybe this is it. Unfortunately it ended with the worst defeat in Viking history ... the 41-0 drubbing at the hands of the NY Giants. The following year was the tragic death of Corey Stringer and that group was never the same. Team went 5-11 and Denny was done. So close but the end of an era. Mike Tice took over and built the team back into respectability. His team always competed and he was working with less support then any coach since. Unfortunately for Tice the Vikes folded up down the stretch missing the playoffs losing to Arizona on the last play of the season. The following year Moss and Culpepper were on fire. Moss was on pace to shatter all receiving records ... then injured his hamstring in NO during the fifth game and never fully recovered. Culpepper had a brillant season and the Vikes snuck into the playoffs after losing to Washington in the final game where they would meet the arch rival GB Packers. As good a memory was that win in GB. Moss scored 2 TDs on half a leg and the Vikes won the game decidely running the clock out on the GB 20. The next week ended per usual with another playoff loss. The next year Moss was traded, the team sold, Culpepper blew out his knee and the Vikings missed the playoffs and Tice was let go. Zygi Wilf was the new owner and he hired Brad Childress to usher in a new chapter in Viking lore. The cover 2 defense was installed along with the west coast offense and drafted Adrian Peterson in '07. Progress was made and in the third year a division championship with a combo of Tarvaris Jackson and Gus Frerotte at QB. Childress faced his mentor Andy Reid and bowed out in the first round. The following year the unthinkable happened ... Brett Favre would become the QB of the Minnesota Vikings. Adding a QB to the '09 team was exactly what was needed. Favre was amazing producing one of his finest seasons as a QB. After going 12-4 the Vikes destroyed the Cowboys at home for the right to face the Saints in NO. The Vikings played great but made mistake after mistake keeping the Saints in the game. Still despite that they had the ball and were driving for a potential game winning FG. Then it happened again ... 12 men in the huddle followed by the Favre INT. NO won the coin toss and after a few controversial calls benefitting them kicked a GW FG to end another season and add another brushstroke to the masterpiece which is Viking football. The following year Favre was convinced to play another year, the Vikes traded for Moss who played for 3 games and was cut after a cold day in NE (attended that one as well). After a blowout loss to GB at home Childress was dismissed and Frazier took over. The season ended with Favre getting hurt and the dome collapsing. Frazier took over the next 3 years and C Ponder was drafted to be the next QB of the Vikings. The second year for Frazier was his best. Adrain Peterson was remarkable returning from an ACL injury to come within 9 crummy yards of breaking the single season rush record. Simply put Peterson literally carried the team to the playoffs. Ponder showed promise in a win to get in on the final day of the season against GB. Unfortunately he was unable to go (though if Musgrave would have run the read option with Webb we might have stole that one) due to a bruise and the Vikes would lose embarrassingly to GB and another season ended with a first round exit. The following year was scary bad with a QB carousel of 3 of the worst QBs ever assembled on one team. It thankfully ended the Childress/Frazier era along with Ponder at QB - with the exception of one more dark night in GB. Which leads us to the present and why we have this thread. A great thread it is. The Zimmer era began two years ago. Norv Turner was hired for OC and Teddy Bridgewater drafted. After a great opening game the hammer came down on Adrain Peterson and took the wind out of the sails of a promising season. Still Bridgewater showed promise and the Vikes entered 2015 with great enthusiasm. After an 11-5 season including a divsion title thanks to a big win on the final day of the season in GB the Vikes got a shot at the two time defending conference champs Seattle Seahawks. Might have 3 SB trophies. Hopefully this team learns and remembers the sting of this loss and how important it is to make sure on every play. For us fans its years and years of learning this lesson. Joined the board in '03 on the S/T site. Had the pleasure of meeting a few posters over the years going back even to my days in Jersey (had an apartment in South Plainfield for 5 years Danimal). Its a great place and outlet. One day its going to happen, when, who knows, but in the mean time am sure there will be plenty of Viking fans young and old hoping and waiting for that day to arrive. Status: offline This is an awesome thread btw, I'm thoroughly enjoying reading it. The same summer that Star Wars came out, I got a Vikings helmet from my Grandma (I was almost 4) and one of those electric football games with the pieces that you can turn the base and they vibrate around. Even though the teams I had were the Steelers and Cowboys, I always pretended the Steelers were the Vikes and we'd pound on the Cowboys. From then on I was hooked. Vikes all the way. The '98/99 game vs the Falcons was the hardest game for me to get through as it was for many. That was a special team and I was sure it was our time for a superbowl. This year had a similar feel of disappointment, but not as bad as this years team didn't have that magical feel to it as that one did. Should we ever win a superbowl in my lifetime, that will be one hell of a relief and will be cause for a huge celebration. SKOL VIKES!! I also got the Viking update way back when. I ran into Lurts in Marco Island a few years ago, I was wearing a Viking cap on the beach and he called me over. Talked to him all afternoon, he had some funny stories. Tony Siragusa came walking by and lurts called him over. I don't think Siragusa even knew who Lurts was. I asked Lurts how tough or easy it was playing for Grant. He said Grant showed the utmost respect for players who played hard. If you didn't you were gone.